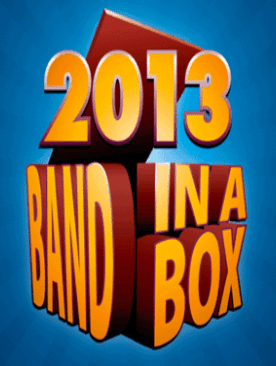 I used Band-in-a-Box (BIAB) for years and loved it – mostly. But I hadn’t upgraded since BIAB 2007. That version is on an old Windows XP laptop of mine that takes several tries to get booted without error. My current computer is a Retina Mac Book Pro with an updated Maverick OS X.
I’ve missed BIAB. Instead of BIAB I tried Impro-visor, a free cross platform tool that has some similarities to BIAB. For free, it’s pretty good. But it doesn’t come close to BIAB. I’ve also tried iPad apps such as SessionBand. Again, these are good for what they are – but they are not a replacement for Band-in-a-Box. I broke down recently and purchased a cross-grade from my old Windows version to the newest Mac version of Band-in-a-Box. I purchased the Pro edition which is the least expensive. I first confirmed I could upgrade to one of the hard disk versions later. You or I can upgrade for the difference in price if they are on the same version, or for the appropriate upgrade price later. The hard disk versions come pre-loaded on an external USB hard drive. They include many more options for bands and styles. These Hard Disks are plug in play, no installation required. But the cross-grade price for the USB drive starts at $299, so I decided to wait before I committed to that. I am both delighted and disappointed in the new version. There is an excellent review from Wheat Williams on the Mac 2013 version. I do not disagree with any of his review. But you should read the comments as well if you want a more complete review of the software. I am going to concentrate on those things that immediately struck me as important or deficient. The first thing anyone notices when you open the program is how dated it looks. It looked dated in 2007 on Windows. This is a longstanding complaint. My own opinion is this is a minor issue. I believe it shows a lack of commitment to keeping the program fresh or even of keeping an eye on usability. But it’s not really a big deal. I purchased the software for what it can do, not how it looks. The first things I noticed are features that were present in 2007 on Windows but are missing in 2013 on Mac. I don’t know if Mac never had these or if the 2013 versions of both programs are missing them. I am perhaps more tuned into these items because I had just tried using these features on the 2007 Windows version about 30 minutes before downloading the new version. 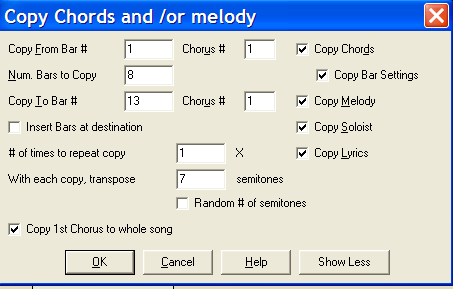 BIAB 2007 on Windows let you copy a block of music and paste it to a new location while transposing the pasted block. 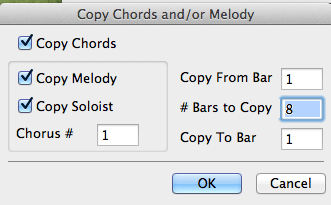 You could even set it to do multiple pastes, each one a fixed number of semitones higher or lower than the previous. This was great for creating practice backing tracks but could also be used for cycling in a tune. BIAB 2013 on Mac still allows you to copy a block to a new measure but no transposing nor multiple pastes in a single step. BIAB 2013 for Mac has fewer copy options than the old version from Windows. With regard to transposition, I see no way in BIAB 2013 to transpose a subset of your composition. All or nothing. Another feature I loved on the old Windows version of BIAB was leadsheets with guitar chord diagrams. The 2013 Mac version will display tab for guitar parts but not chord diagrams. That’s a major disappointment. It is of course possible that the above complaints are misplaced and in fact those features are still present but I haven’t figured out how to used them. If that’s so, then another fair complaint is the help system, manual and online forums do not allow you to easily discover how these things are done. I looked in all the places I could think of, using all the search terms I could think of – I even did Google searches which often turn up answers where direct searches of corporate help and forum sites don’t find anything. But I got nothing with Google too. One of the newer features are RealTracks, RealDrums and RealStyles. RealTracks substitute professionally recorded audio tracks for the midi that BIAB has used for years. There are still midi options but RealTracks are going to sound better. I’m sure this is an improvement that many have wanted. It makes BIAB more competitive with GarageBand and other audio editing and looping software. But there is a downside if you choose to use styles that include RealTracks. Because they aren’t midi, you can’t reassign the midi instrument being played. One the great advantages of BIAB had been the ease of customizing the backing band. You first chose a style then could mute parts you didn’t need and if necessary you could substitute the default midi instrument with another of your choice. Play the piano part as a jazz organ or take a sax melody and play it as a guitar. Your options for reassigning or muting instruments is more limited with RealTracks because the parts are from an actual audio recording. There are two solutions to this if you feel the need to get a different band together. First is only use midi styles. The other is to buy one of the hard disk versions of BIAB that has a much larger selection of RealTracks. I’ll use midi for now. It may seem like I’ve got a lot of criticisms of BIAB but the truth is I really enjoy having my backing band back in my computer. I’ve missed this program and nothing else out there does as good a job at making practice and backing tracks quickly and easily. I don’t want to be an audio editor and patch together loops to make a backing track. I don’t want to “play” virtual instruments to generate a backing track. I want to give the software the chord structure, pick a style, tempo and edit a band and play. That’s exactly what BIAB does.